If you’ve ever wondered what might happen if Batman’s rogues gallery was made up entirely from creations of his own mind (and only visible to himself) rather than individuals who are, more often than not, created as a result of his actions, then I recommend that you read Legion: The Many Lives of Stephen Leeds (2018). Compiled herein are two of Brandon Sanderson’s previously-published novellas, “Legion” (2012) and “Legion: Skin Deep” (2014), along with the concluding and never-before-seen third novella, “Lies of the Beholder.” I hadn’t read any of these works before opening Legion, nor had I read Kat and Tadiana’s reviews of the first two novellas, so everything within was completely new to me; I will do my level best to keep my reviews of each novella spoiler-free. Stephen Leeds is a reclusive genius extraordinaire, who copes with his schizophrenic hallucinations of voices by giving them distinct names, faces, and — as far as he is concerned — physical presences. Stephen refers to them as “aspects,” and, helpfully, the aspects also take on specialized knowledge and skills that he acquires so that the information is still accessible to him without having to remain an active part of his mind. An aspect might be an expert on linguistics, for example, or forensic investigations, and can then be relied upon by Stephen to assist him during times when he needs it. Stephen is often hired by individuals, government officials, or corporations in order to solve the unsolvable, which is a lucky thing, because it’s not clear how else he might make a living. The aspects help him make sense of situations and clues by using of their expertise, which is an interesting way of examining how the human mind stores and recalls data, as well as the interplay between the conscious and unconscious mind. The aspects each have specific mental instabilities, in addition to being manifestations of Stephen’s own mental instability, which is a fascinating glimpse into the morass that is Stephen’s mind, alongside the fascinating tidbit that most of them are deeply uncomfortable with the notion that they are not, in fact, real people. Stephen generally relies on three aspects: Ivy, whose field is psychology; Tobias, a calming, centering presence who gathers minutiae and trivia; and J.C., a former Navy SEAL and weapons/security expert. Other aspects are formed as needed, though it does take deliberate effort from Stephen to learn new information and then manifest someone to speak with and advise him. But, as time goes on, readers discover that Stephen’s degree of control over his aspects — and, most crucially, himself — might not be as firm as he’d like to believe. The camera itself is fascinating, if a little confusing: it can take pictures of specific people or important events which happened in a location’s history, like George Washington during a morning shave or Elvis right before his death. The precise mechanism of how it manages this seemingly impossible feat is unknown, and Sanderson leaves a lot of the practical questions unanswered, much to my frustration. Stephen’s search first takes him and his core trio of aspects to the apartment of the brilliant Filipino-American scientist who created the camera, then to Jerusalem, where control of the camera and what it could mean for humanity’s religions hangs in the balance. The action scenes are intense, and Stephen comes away from this encounter with disturbing questions about the exact nature of his aspects and his own mental stability. 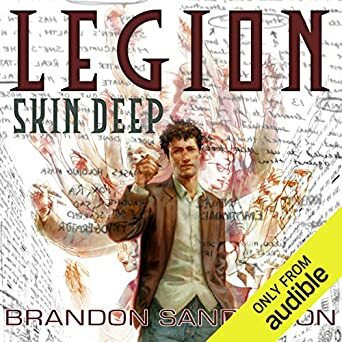 Sanderson fills Legion’s novellas with a good amount set-up for the mysteries at hand, and in “Skin Deep” it’s obvious that he did a thorough amount of research into forensic work and next-level theories into data storage via the human body. This novella was the strongest of the three, combining intrigue, corporate espionage, and action into a fully-cohesive whole. The plot device is explored more satisfactorily than its predecessor, and the mystery is resolved in a way that feels fully plausible despite its fantastical elements. Most importantly, the character work here was top-notch, not only with regard to Stephen and his aspects, but with the people affected by and underpinning the mystery. “Lies of the Beholder,” as I’ve mentioned, is the brand-new conclusion to Stephen Leeds’ story, and Sanderson takes the novella in a direction that I didn’t anticipate, despite the jacket copy’s proclamations that it would be “shocking.” A sometimes-ally of Stephen’s has called in a favor, so he (accompanied by Tobias, Ivy, and J.C.) meets with a biographer/researcher for an interview which very, very quickly goes off the rails. A bit of Stephen’s background is dredged up, providing glimpses into what his life was like before Sandra helped him gain any measure of control over his mind, but before the biographer can reveal her true purpose in speaking with Stephen, he gets an urgent text from Sandra — which ignites a debate between himself and, well, himself as to whether she can be trusted. Sandra is involved in something big, with people who very badly want Stephen to cooperate, though the surface-level explanations only hint at the true goals and motivations. His single-minded efforts to reconnect with her only serve to put himself and the aspects in greater and greater danger, and much will be sacrificed along his path to understanding and resolution. I have some major quibbles with how “Lies of the Beholder” and, therefore, Legion resolves. There are moments which reveal much about Stephen’s mental state and which explore the power of the mind over one’s physical body, particularly in a terrifying encounter with an aspect who goes rogue, and in conversations with certain aspects and with the biographer, Jenny Zhang. But the Big Bad here is a paper tiger, propped up by technobabble and grand plans that require an even heftier suspension of disbelief than a camera that mysteriously takes photos of specific moments in the past. Sandra doesn’t stand up under the weight of the emotional baggage Stephen attributes to her, either; I thought there would be more exposition or exploration of how they came to mean so much to one another, and why her abandonment of him is still an open wound. I thought “Legion” did a good job of setting everything up, and “Legion: Skin Deep” definitely got its hooks into me. “Lies of the Beholder” didn’t coalesce in a satisfying way — it felt like set-up for something more, and ended too abruptly. While reading Legion, I constantly had questions about how things are accomplished that went unanswered, and I couldn’t completely suspend disbelief for the plot devices in each novella, or for the way that people Stephen interacted with would just let space hang during conversations so that Stephen’s aspects could speak to him. I felt that the aspects should seem real to Stephen and the reader (to an extent), but not to the majority of the other people he’s supposed to be interacting with. Ultimately, I like a lot about the first two novellas, but the third ends up, tonally, more like a thriller/slasher flick that ping-pongs everywhere without landing on anything truly substantial in the end. There are neat ideas, but Sanderson doesn’t develop them fully, placing more attention on frantic action sequences and abrupt shifts in setting. On the other hand, his exploration of psychology and human behavior throughout the trio of novellas is very interesting, and the core concept itself is a profoundly fascinating one. I hope readers will make a special point of paying attention to the gradually-changing Rorschach images which head each chapter of Legion, as they’re sure to captivate readers and inspire debate as to their significance. The premise was simple: What if a man’s hallucinations proved beneficial to him in his life, rather than the typical distraction? It’s such a unique concept, and Brandon Sanderson has a lot of fun with it. Stephen Leeds has given form and shape to the voices in his head, giving them each a unique personality and field of expertise (based upon Stephen’s own readings). And once Stephen passes off his knowledge about, say, computers to a particular aspect, that knowledge is completely unavailable to him, “forgotten” by Stephen unless the aspect tells him about it in an imagined discussion. Stephen has been so successful solving crimes and other complex problems using his invisible army of experts that he’s been able to buy a mansion large enough to house himself and his cohort of some forty-plus aspects (who each require their own room) and distance himself from an overly-curious world. Now he accepts only those cases that he finds particularly interesting. The mystery in “Legion,” the first novella, involves an international search for a stolen camera that can take pictures of people and events at any time in the past. It’s a device that’s been used several times before in science fiction; most notably, T. L. Sherred’s 1947 novelette “E for Effort” (collected in The Science Fiction Hall of Fame: Volume 2B), Isaac Asimov’s 1956 short story “The Dead Past,” and Orson Scott Card’s 1996 novel Pastwatch: The Redemption of Christopher Columbus. Legion doesn’t really add anything new from a science fiction point of view. Sanderson’s story points out some of the problems with the theory of time travel (branching paths of reality; Earth not being in the same place in space as it was in the past you are traveling to, or taking pictures of), but it doesn’t ever try answer those questions. You create these delusions so that you can foist things off on them. Your brilliance, which you find a burden. Your responsibility — they have to drag you along and make you help people. This lets you pretend, Mister Leeds. Pretend you are normal. But that’s the real delusion. But real or not, Stephen’s legion of invisible experts are a lot of fun to read about. I’m especially fond of J.C., the politically incorrect ex-Navy SEAL aspect whose smart-mouth comments are the source of most of the humor in the Legion stories. “Skin Deep,” the second novella, gives J.C. another chance to shine, as Stephen and his aspects (he’s up to 47 now, though only a handful play a significant role in these stories) search for a missing corpse whose cells contain an invaluable scientific breakthrough. We all stared at him for a moment. “Let’s shoot him,” J.C. said. The mystery of “Skin Deep” concerns a dead man who was a pioneer in biotechnology, and developed a method for storing massive amounts of information in the cells of the human body. He’s believed to have stored some ground-breaking scientific information in his own body before he died. His corpse has now gone missing, and competing parties are in a potentially deadly race to find it. Stephen, despite his intentions otherwise, gets roped into investigating the case. I agree with Jana that the mystery in “Skin Deep” is much more satisfying than the one in “Legion.” Still, I thought “Skin Deep” would have benefited from more depth and detail; I’m not sure the novella length was the best choice. The real pleasure in this novella is, once again, reading about Steve and his hallucinatory alter egos. Sanderson handles it all with a deft, humorous hand. As “Lies of the Beholder” begins, Stephen Leeds is giving a private interview to Jenny Zhang, a reporter who begins displaying far more insight into Stephen’s mental state and thought processes than he’s comfortable with. This uncomfortable interview is interrupted by a text from the long-missing Sandra that says, simply, HELP. Stephen is desperate to find Sandra, but her trail is elusive … and some of Stephen’s aspects are becoming alarmingly unreliable. “Legion” and “Skin Deep” are both fun, fairly light reads with some intriguing psychological aspects. “Lies of the Beholder” is significantly different in tone. 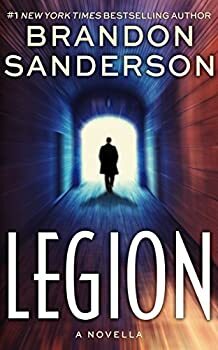 Without getting into spoiler territory, I admire Sanderson’s decision to take the final Legion story in a different, darker direction, but the final story felt like it needed more fine-tuning. The concept and basic plot of “Lies of the Beholder” is a strong one and had several truly surprising ― even shocking ― moments. However, there are some significant plot holes here, and I didn’t think the various elements tied together in a way that was sufficiently logical within the framework of this universe. As a result, I was left feeling vaguely dissatisfied with the resolution of Stephen’s story. That dissatisfaction was underscored by a final wrap-up that suggested a far too simple answer to the problem of Stephen’s schizophrenia. I’m still enthusiastic about Legion: The Many Lives of Stephen Leeds as a whole. Stephen and his aspects are both original and appealing, and their interactions never cease to captivate and amuse me. The new hardback edition of these collected stories has an appealing, clever cover image of a fractured Stephen, and the evolving images at the beginning of each chapter are even more fascinating, not to mention thematically appropriate. It begins as a Rorschach test type of inkblot image, and then I thought it was turning into a brain scan. But gradually it becomes clear that the artist has created something far more significant ― particularly as the image starts to devolve later in the book. Kudos to both artists! Here are Kat’s reviews of the first two novellas in this volume. She read the audiobook editions when they were first released. She hasn’t read the third yet. I’m a fan of Brandon Sanderson’s vivid imagination, so I was happy to get a copy of Legion, his new 88 page stand-alone novella. It’s about Stephen Leeds, a man who’s been diagnosed with schizophrenia because he sees and hears people who don’t exist. The thing about Stephen, though, is that unlike most schizophrenics’ hallucinations, the people in Stephen’s head actually help him. They all have their own talents and areas of expertise (and their own mental illnesses) and if Stephen needs to know something they don’t know, some other “aspect” is likely to show up to offer some help. This makes him valuable to anyone who needs help — it’s like hiring a “legion” instead of just one guy. Therefore, Stephen is highly paid and lives in a mansion with enough rooms to house all his special friends. Stephen’s current petitioner is unusual. Monica, and the people she works for, have lost a camera that can take photographs of the past. It seems to be an inside job and they need Stephen and his aspects to find the guy who stole it. Intrigued, they take the job when they realize that the thief hopes to produce photographs that will change the world, or at least the worldview, of millions of people. They know the photos will have a huge impact, but they don’t know if it will bring world peace or world war. As I mentioned, I love Brandon Sanderson’s imagination, and he doesn’t disappoint in Legion. Stephen and his crew are unique characters — each of the aspects has its own personality and is a character in his or her own right. Due to the shortness of this novella, they don’t get developed as much as we’d like, and some of their dialog is a bit stilted, but I certainly hope we’ll be seeing more of them in future stories. They’re all interesting and the hallucinatory nature of Stephen’s aspects’ existence offers plenty of opportunities for humor. I don’t want to give away any more of the plot, especially in so short a story, but I will say that, like Stephen and his friends, I was intrigued and excited by the possibilities the camera offered, though I had to work harder than usual to suspend my disbelief because I couldn’t figure out how the camera could take a picture of the exact historical person or object desired when there would be so much “noise” from all the history that a single place would hold. Legion asks us to consider past and current world events (especially in the area of religion and politics) and our own personal religious beliefs. What would our world be like if we had scientific evidence to back up our faith? Or if religious beliefs other than our own could be empirically verified? And if we could prove our beliefs, what is the meaning of faith? Legion is a quick exciting read. 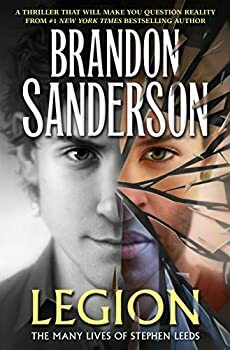 This concept and plot is worthy of many more pages, though, so I sincerely hope that Brandon Sanderson will be writing more stories about Stephen Leeds and his legion. The audiobook narration by Oliver Wyman (Audible Studios) is terrific. 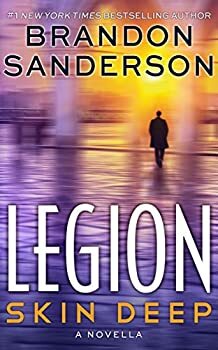 Legion: Skin Deep is the second novella in Brandon Sanderson’s series about Stephen Leeds, a man whose psyche has spawned a “legion” of extra personalities that he thinks of as “aspects.” Stephen is the only person who can see his aspects — each is a separate personality who lives with him and can follow him around and help him solve problems. Everyone else thinks Stephen has schizophrenia or multiple personality disorder, but it’s not the same thing. Stephen doesn’t know why he has all these aspects or why he creates new ones when he learns something new. There’s one woman (Sandra) who can help him understand, but she has disappeared. When we met Stephen in the first LEGION story (simply called Legion), he was helping a client find a camera that can take pictures of past events. This had interesting ramifications for politics and religion. In Skin Deep, Stephen and his aspects have been hired to find a missing corpse that contains some innovative biotechnology — part of the body might have been used to store some deadly data. If the body is not recovered and cremated soon, that information might get into the wrong hands and could cause a worldwide epidemic. Like the first LEGION story, Skin Deep is creative and exciting. In this case, it’s cool to think about the capabilities (and security risks) of biotechnology as scientists work to find more efficient and flexible ways to store large amounts of data. What would happen if we started using the body’s DNA, which naturally holds a vast amount of information, as basically a really big flash drive? Sanderson uses the opportunity to briefly discuss topics such as Open Source and Wetware. Skin Deep is also partly a mystery — who stole the corpse, and how did they do it? Where is the keycode? I was in the dark until the last pages, though Sanderson gave me a few clues that I missed (I love it when that happens). I mentioned in my review of Legion that the shortness of these stories means that we don’t get to know Stephen’s aspects very well, but in Skin Deep we get to spend a lot of time with three of them — Tobias is a historian, Ivy is a psychologist, and J.C. is an ex-Navy Seal. Ivy and J.C. have an on-again-off-again romance which adds some humor and some extra weirdness. J.C. doesn’t want to admit he’s not real, so he thinks of himself as an inter-dimensional time traveler who comes to help people in need. (Each of the aspects has their own personality quirks and maybe even mental illnesses.) The aspects can eat, go to the bathroom, and talk to each other on imaginary cell phones. I’m not really sure it always works, but it’s entertaining and it does solve the problem for Sanderson of how to make his hero have so much knowledge and skill without making him seem like a god. There’s so much more that Sanderson can do with Stephen and his “friends” and it seems clear that more LEGION stories are planned. I’m glad. The print versions are being published by Subterranean Press and the audio versions are produced by Audible Studios. I have and can recommend both. As I write this, the audio version of Skin Deep is free. Oliver Wyman does a great job with the narration. Ominibus edition published in September 2018. (First two novellas published in 2012 and 2014.) 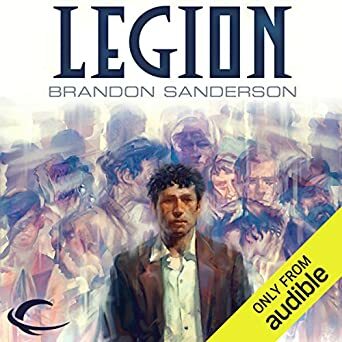 Legion: The Many Lives of Stephen Leeds, is #1 New York Times bestselling author Brandon Sanderson’s novella collection of science fiction thrillers that will make you question reality–including a never-before-published story. Stephen Leeds is perfectly sane. It’s his hallucinations who are mad. A genius of unrivaled aptitude, Stephen can learn any new skill, vocation, or art in a matter of hours. However, to contain all of this, his mind creates hallucinatory people―Stephen calls them aspects―to hold and manifest the information. Wherever he goes, he is joined by a team of imaginary experts to give advice, interpretation, and explanation. He uses them to solve problems . . . for a price. His brain is getting a little crowded and the aspects have a tendency of taking on lives of their own. When a company hires him to recover stolen property―a camera that can allegedly take pictures of the past―Stephen finds himself in an adventure crossing oceans and fighting terrorists. What he discovers may upend the foundation of three major world religions―and, perhaps, give him a vital clue into the true nature of his aspects. Legion: The Many Lives of Stephen Leeds includes Legion, Legion: Skin Deep and the brand new, shocking finale to Leeds’ story, Lies of the Beholder. When I saw the title I wondered how these were going to differ from the Marvel/FXX series of the same name. It certainly is a similar concept, but I can see that Sanderson has taken in it a different direction. I just read an article about using human cells to store data, and so “Skin Deep” piques my interest the most.